Tired of the same old fundraising options for your school or nonprofit? Had enough with encouraging parents, friends, kids and volunteers to sell candy bars, baked products, gift cards, popcorn, tickets, car washes – the list goes on-and-on. Tired of working so hard to put on an annual event only to start planning it all over again soon after it’s over. Or just looking for an additional fundraising solution? Meet Swype! Swype has a solution that continues to generate money for your organization year after year. How much money is only limited by the number of businesses participating. Efforts spent recruiting local businesses generate ongoing income for years to come and growing the annual income is easy. There is no additional cost to the businesses participating and in fact they are rewarded with more business because customers like doing business with businesses that give back to their community. If you are a public or private school please visit our Tools 4 School page for more information. 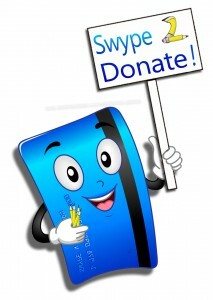 If you are a nonprofit please visit our Swype 2 Donate page for more information. If you are a business who would like to help a school or nonprofit of your choice by having us donate 20% of our profits from your merchant account annually – we will meet or beat your current credit card processing account and help you grow your business. Call or write today for more information.